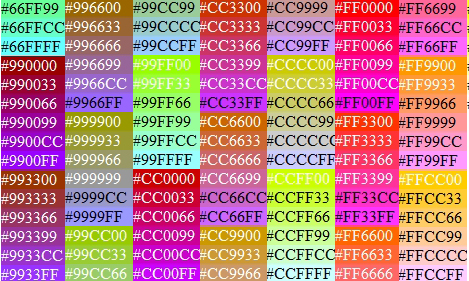 The 216 web safe color palette was created to ensure that all computer would display the colors correctly when running a 256 color palette. The World Wide Web Consortium has listed 16 valid color names for HTML and CSS they are: AQUA, BLACK, BLUE, FUCHSIA, GRAY, GREEN, LIME, MAROON, NAVY, OLIVE, PURPLE, RED, SILVER, TEAL, WHITE and YELLOW. To use other colors in a website, web builders must specify their HEX value.